I grew up in Los Angeles in the 1970s and my uncle took me, my brothers and cousins out for exotic meals, such as sushi and authentic Chinese food (exotic in the 70s), sparking my interest in different flavors and cuisines. Later, when I was traveling the world with the US Navy I would always explore local foods and then try come home and try to replicate it. Pressure canned food that is boiling in the jar at near room temperature because of the high vacuum in the jar. A simple middle school experiment, certainly, but I still get a kick out of it every time I pressure can food. Milk. It is one of the main distinctions between mammals and other animals and is a nearly perfect food for growing infants. Although many adults are lactose intolerant, many others have the most recently evolved ability (unlike most mammals) to digest milk. And beyond the simple beverage, our ability to transform milk’s texture, flavor and form amazes me. Yogurt (and all its permutations), cheeses, whey, ice cream, whipped cream, powdered milk, etc. etc. etc. Evolution. The incredible diversity of life on our planet is awe inspiring and readily explained by, in broad terms, a relatively simple and elegant process. It boggles the mind. Evolution made many, many very delicious things. Anything pasteurized. Many of us would not be here today without food that has been made safer for human consumption through pasteurization. Does this mean that everything has to be pasteurized? Of course not. But the fact that we are even able to debate whether or not certain foods should be pasteurized is thanks to that saint of food preservation, Louis Pasteur. One of the main goals of the Master Food Preserver program is to teach the general public researched-based safe food preservation practices. My hope is that we will see more scientific research that will increase what we are able to teach to home cooks. Milk. Eggs. Cheese. Homemade Fermented Hot Sauce. Preserved Lemons. Preserved lemons. They are incredibly versatile. They can be used in any dish that can be improved by lemon and salt … and there are few dishes that cannot be improved by lemon and salt. It isn’t a cookbook per se, but The Flavor Bible by Karen Page and Andrew Dorenenburg is my go to book when I want to cook. It provides a compendium of ingredients and what other ingredients they pair well with. There are no recipes, but if you know how to cook, you can use this book to inspire you. I use it to cook out of my pantry. I’ll see what I have available and then look through the Flavor Bible until I am inspired to make a dish. Leftovers, primarily, but porridge (not just oatmeal) and yogurt are my staples. 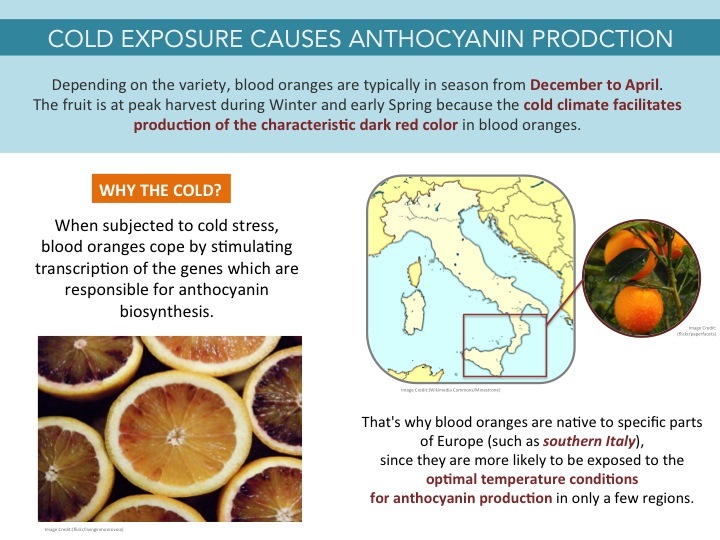 While traditional oranges are available at your local supermarket all year long, the best time to enjoy the juicy, crimson flesh of blood oranges is during these winter months. 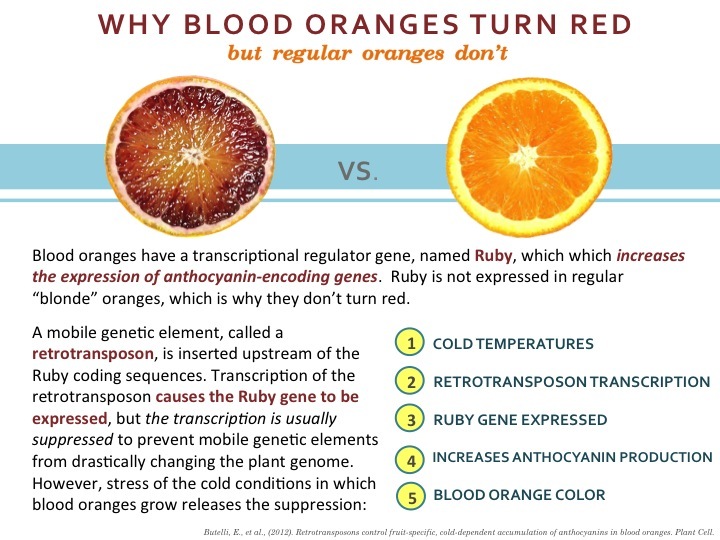 So while you venture out for some delicious blood oranges, consider these fascinating tidbits. How do they get their characteristic color? 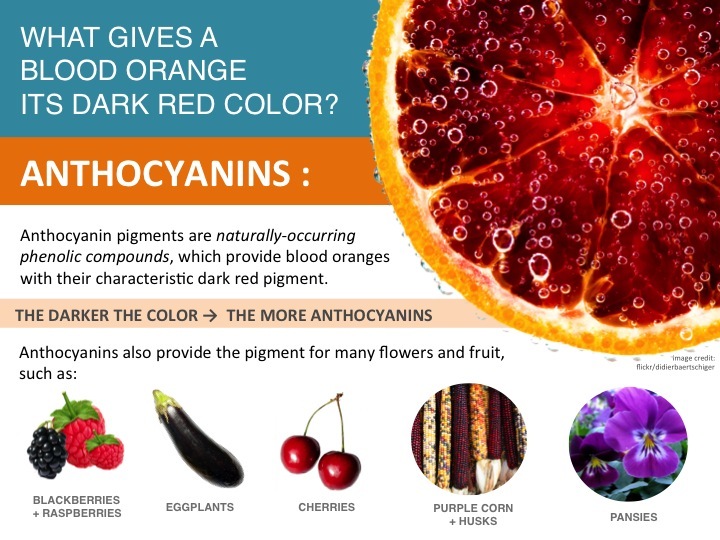 How are they different from everyday oranges? About the author: Eunice Liu is studying Linguistics at UCLA. She attributes her love of food science to an obsession with watching bread rise in the oven. One of the most aggressive flavors we can experience is spiciness. 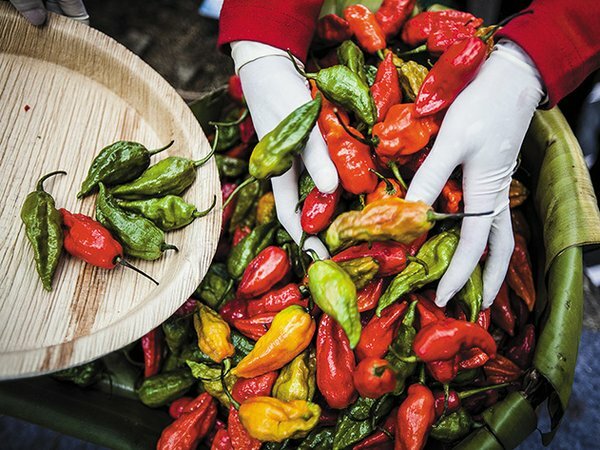 Imagine a bright red chili pepper whose color gives us fair warning of its propensity to ignite a fire. In fact, a common physiological response to eating spicy food is analogous to the way our body responds to an elevation in internal body temperature. You can feel the burn. The consumption of spicy ingredients triggers our exocrine (sweat) glands to secrete fluid at the skin’s surface to promote cooling through the evaporation of our perspiration. 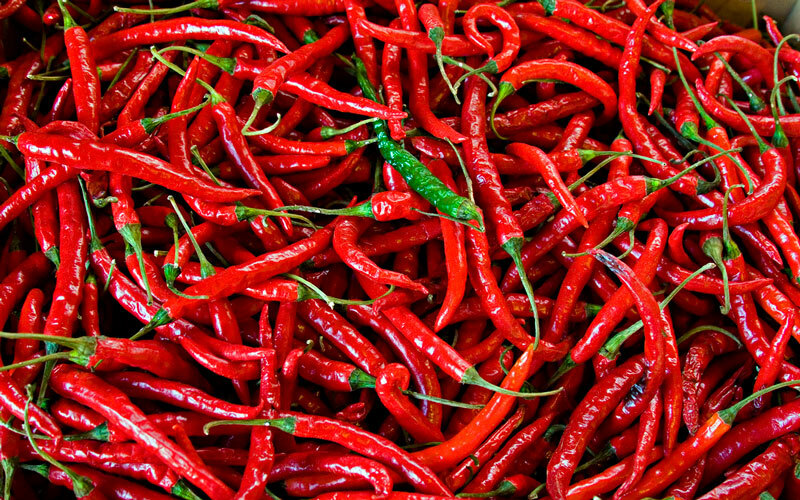 So how is it that spicy food can make us sweat? The answer lies in our head. Our body’s reaction to spiciness is a result of input delivered from receptors in our mouth to our central nervous system. A compound found in many spicy ingredients such as chili peppers is called capsaicin. This molecule activates sensory neurons in our mouth called thermal nociceptors [1,2]. The activation of these thermal pain receptors in turn stimulates our sympathetic nervous system , which is associated with our body’s “flight-or-flight” responses. 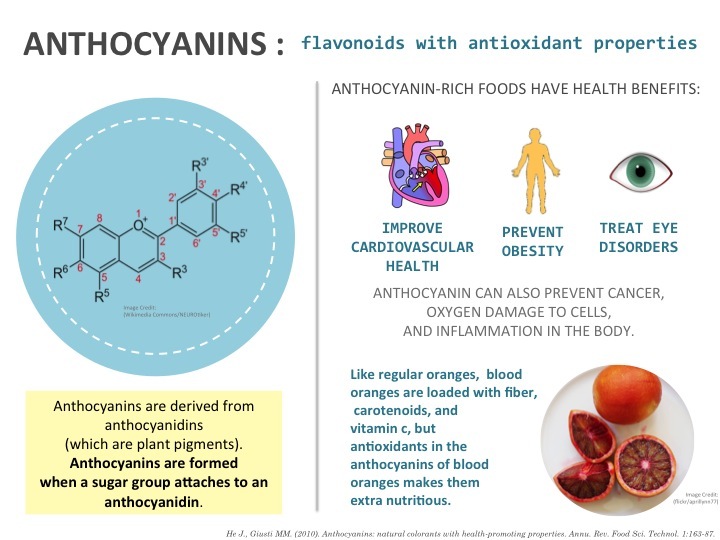 Therefore, the characteristic increase in heart rate and sweat production due to the consumption of capsaicin-rich ingredients is due in part to the capsaicin’s role in adrenaline secretion . If you decide to brave the spice, here’s some advice: When it comes to relieving the pain of the capsaicin burn, your best bet is to have a glass of cold milk or better yet, a bowl of ice cream. The compound, casein, is a hydrophobic substance found in milk that operates to “absorb” the lipid-rich capsaicin molecules making it easier to cleanse your mouth of the spicy chemical . However, capsaicin isn’t the only fiery compound that can elicit unique physiological responses. On the other end of the spectrum is a compound known as hydroxyl-alpha sanshool, commonly found in Z. Bungaenum peppercorns. 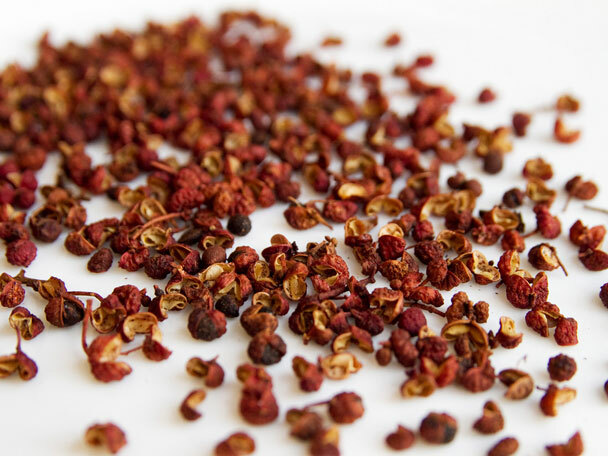 This variety of peppercorn is commonly grown in the Sichuan province of China, and is referred to as the Sichuan peppercorn. The characteristic “flavor sensation” one might experience when eating Sichuan cuisine is a mind-numbing spiciness. Hydro-alpha sanshool activates somatosensory neurons that are responsible for detecting innocuous stimuli such as a gentle touch. This is opposite of the nociceptors that detect capsaicin which primarily detect noxious or painful stimuli. The stimulation of somatosensory neurons by hydro-alpha sanshool produces a similar effect to local anesthetics used to moderate pain in surgery. The compound found in Sichuan peppercorns trigger somatosensory neurons to prevent the influx and efflux of electrolytes, Na+ and K+, through ion channels [6,7]. The resulting effect of hydro-alpha sanshool is to cease the propagation of neuronal action potential through the nervous system’s pain pathways. So, when you enjoy a delicious dish of Liang Fen (Cold Mung Bean Noodles with Sichuan Peppercorn/Chili Vinegar), or Suan Cai Yu (Poached Fish in Green Sichuan Peppercorn Sauce) you can experience thrilling mouth numbness. Your first instinct after eating these dishes will be to grab the closest glass of water available to you. Interestingly, a sip of flat water after eating these dishes will produce a surprising fizziness like you might experience while drinking sparkling water. Caterina, M., Schumacher, M., Tominaga, M., Rosen, T., Levine, J., Julius, D. “The capsaicin receptor: a heat-activated ion channel in the pain pathway”. Nature. 389 (1997): 816-824. Liu, M., Max, M., Parada, S., Rowan, J., Bennett, G. “The Sympathetic Nervous System Contributes to Capsaicin-Evoked Mechanical Allodynia But Not Pinprick Hyperalgesia in Humans” The Journal of Neuroscience. 16.22 (1996): 7331-7335. Ohnuki, K., Moritani, T., Ishihara, K., Fushiki, T. “Capsaicin Increases Modulation of Sympathetic Nerve Activity in Rats: Measurement Using Power Spectral Analysis of Heart Rate Fluctuations”. Bioscience, Biotechnology, and Biochemistry. 65.3 (2001): 638-643. Watanabe, T., Sakurada, N., Kobata, K. “Capsaicin-, Resiniferatoxin-, and Olvanil-Induced Adrenaline Secretions in Rats Via the Vanilloid Receptor” Bioscience, Biotechnology, and Biochemistry. 65.11 (2001): 2443-2447. Fire and Spice. General Chemistry Online!. Tsunozaki, M., Lennertz, RC., Vilceanu, D., Katta, S., Stucky, CL., Bautista, DM. “A ‘Toothache Tree’ Alkylamide Inhibits AD Mechanonociceptors to Alleviate Mechanical Pain” Journal of Physiology. 591 (2013) 3325-3340. Bautista, DM., Sigal, YM., Milstein, AD., Garrison, JL., Zorn, JA., Tsuruda, PR., Nicoll, RA., Julius, D. “Pungent Agents from Szechuan Peppers Excite Sensory Neurons by Inhibiting Two-Pore Potassium Channels” Nature Neuroscience. 11.7 (2011): 772-779. “Sous vide,” or “under vacuum,” refers to a style of cooking in which food is sealed in a plastic bag and submerged in a water bath that is held at a controlled temperature . This technique originated in ancient times when humans wrapped their food in salt, fat, animal leaves, and animal bladders before cooking . Sous vide in its fully realized form began in the 1960s as NASA scientists began to incorporate this concept into creating astronauts’ sealed-bag meals . In the 1970s, French chefs (who had already popularized cooking en papillote or in paper), adopted the sous vide technique of cooking in plastic . From here, sous vide spread to professional kitchens across the world, but it was not until the 1990s that food scientists began to study the deeper science behind sous vide processing. 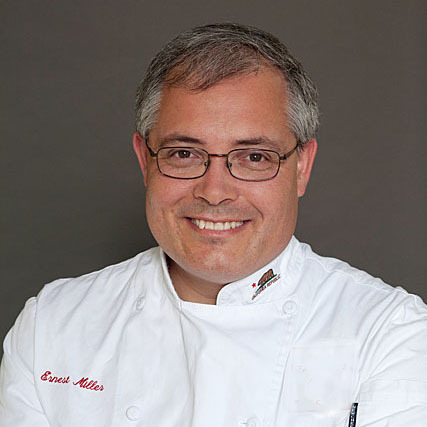 By the mid-2000s, sous vide became widely known and the past decade has seen a massive increase in its popularity  where it is heralded as “the most important technological advance in the kitchen since the microwave.”  Before sous vide machines were accessible to the home chef, a common method was using an ice chest, which keeps water hot long enough to effectively sous vide food . Although this is still a popular and inexpensive technique, sous vide machines are now available from many brands for under $200. The appeal of sous vide comes with its ease and ability to precisely control the temperature at which the food is cooked. By targeting a specific minimum temperature at which proteins denature, it is virtually impossible to overcook your food. When food is cooked by traditional methods such as on the stovetop or in the oven, the outside of the food rises to temperatures that are much higher than the final desired temperature of the food. This increases the risk of overcooking the outside (and inside) of the food in an attempt to reach the correct internal temperature. By using sous vide, food is cooked for a longer period of time and at a lower temperature than usual and is raised uniformly to the same temperature . This prevents evaporative loss of moisture (Fig. 1) and enables tough cuts of meat to be made tender while still cooking them medium/medium-rare . 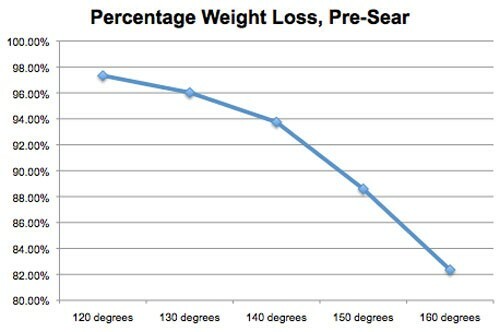 Figure 1: The weight loss (moisture loss) from New York strip steak at varying temperatures ranging from 120-160°F . Another advantage to sous vide is from a nutritional standpoint. Sous-vided vegetables retain their vitamins and trace elements; by contrast, boiling removes 60% or more of these nutrients . Sous vide also requires little added fat (oils, butter, etc. are usually added solely for flavor). Additionally, because the food is sealed in a plastic pouch, this largely reduces oxidation and therefore preserves the nutritional qualities of polyunsaturated fatty acids . Lastly, because food can be cooked at lower temperatures, the vitamins that are normally destabilized at the high temperatures of traditional cooking methods are preserved . While this effective technique was formerly limited to professional kitchens, it is now accessible for the home cook! Companies such as Anova, Nomiku, and Sansaire have recently developed sous vide machines at an attractive price point. Fascinated by the attention around this rapidly popularized method, I purchased my own Anova and set out to test to see if these sous vide machines lived up to the stories. The first beast I tackled was the one I have always had a penchant for overcooking – the New York Steak. No matter what technique I tried to use, I always end up oversearing and getting a ring of medium-well steak around my perfectly medium-rare center. Using one of my favorite sites for recipes, Chef Steps, I attempted their Simple Sous Vide Steak with Red Wine Sauce. I pre-seared my steaks (this gives you a better crust at the end of the cooking process), placed them in a Ziploc bag with some butter, and popped them into my preheated 135°F water bath. After an hour I removed the steaks and quickly seared them again to get a delicious golden brown crust. Result? Mouthwatering, juicy, tender steak with unbelievable flavor and a beautiful medium-rare interior that extended from edge to edge. Absolute gastronomic perfection. Thrilled with the results of my first experiment, I tackled a variety of other proteins and the results of these attempts are shown below. Salmon was so simple: a quick 20 minutes at 126°F yielded the most buttery salmon I had ever tasted, with a compelling sashimi-like texture. My impression of at-home sous vide? Stellar. Not only was the entire cooking process easy, but I was guaranteed to get perfect results every time. The flavors and moisture retention were incredible. And the added nutritional value is just the cherry on top of the already sweet, sweet cake. Baldwin, Douglas. “Sous Vide Cooking: A Review.” International Journal of Gastronomy and Food Science 2012: 15-30. Print. Myhrvold, Nathan. “Why Cook Sous Vide?” Modernist Cuisine. Cima Creative, 2013. Web. 24 November 2015. Renton, Alex. “Sous Vide: The Chef’s Secret Coming to Your Kitchen.” The Guardian. Media Limited, 2014. Web. 25 November 2015. López-Alt, J. Kenji. “Cook Your Meat in a Beer Cooler: The World’s Best (and Cheapest) Sous Vide Hack.” Serious Eats. Serious Eats, 2010. Web. 2 January 2015. Suchy, Sara. “Testing Cooking Temperatures of Sous Vide.” Inside Science. American Institute of Physics, 2013. Web. 25 November 2015. López-Alt, J. Kenji. “How to Sous Vide Steak.” Serious Eats. Serious Eats, 2010. Web. 2 January 2015. Sasson, L. (2006). Functions of Fat Lecture, New York University. Buckley, C. (1987). “Storage stability of vitamin C in a simulated sous vide process.” Hotel and Catering Research Centre Laboratory Report 238: 2.